ADVANCE NOTICE: To be offered as part of our three-day auction of Antiques, Fine Art & Collectors’ Items on the 1st December 2011 in our sale of British and Continental Ceramics and Glass. 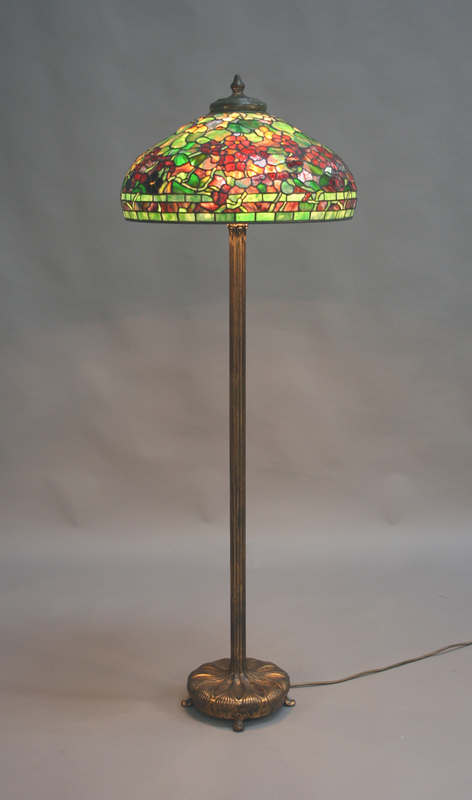 As part of an important group of American Art Nouveau lamps consigned for sale by a lady. 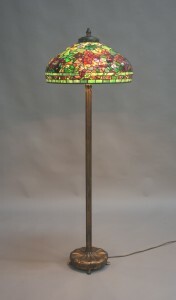 A Tiffany Studios Nasturtium pattern green and brown patinated domed leaded glass shade and matched gilt bronze floor lamp, circa 1910, the column base with relief stem detail emanating from the circular foot with stylized onion moulded decoration, raised on four scroll feet, shade stamped ‘Tiffany Studios New York’, base underside stamped ‘Tiffany Studios New York 379’, overall height approx 164cm, diameter of shade approx 55cm. Presale estimate £40,000-£60,000. For further images of this floor lamp click here.